Now that Page is in school–two schools if we’re being technical–there are always opportunities for me to cook, or prepare treats for her classes. This week has been particularly hectic because both schools are doing fundraising drives, and if you’re a parent then you know the schools require a lot of participation from parents in the form of raising money and volunteering to bring food and elbow grease. 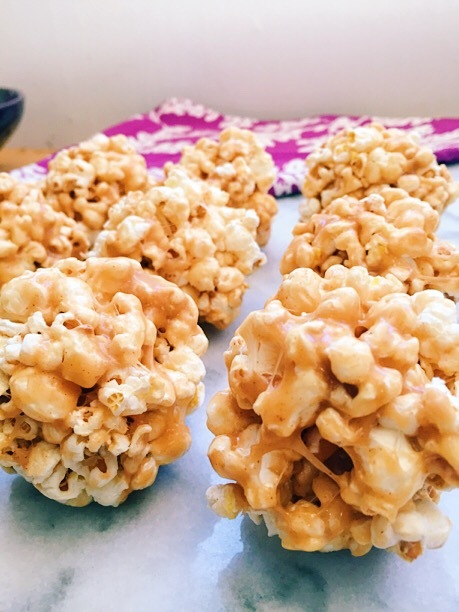 Luckily for me none of the kids in Page’s class have food allergies, so I decided to make these popcorn balls. 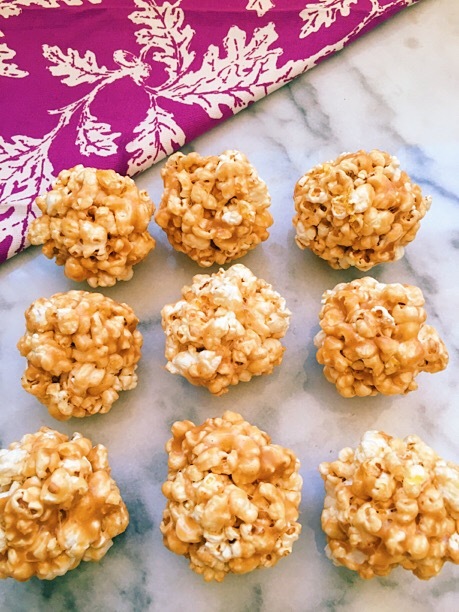 Popcorn balls have always been one of my favorite Halloween treats. They contain popcorn and marshmallows, really what’s not to love? 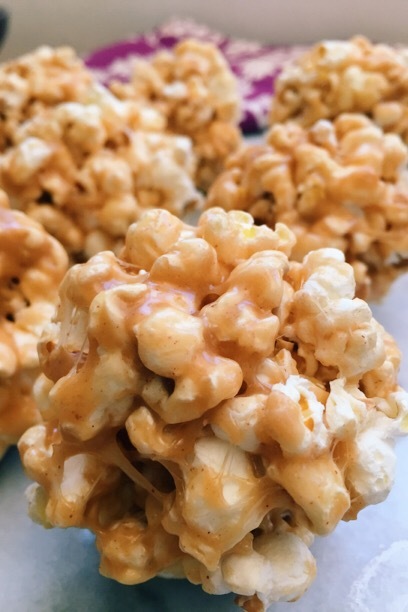 These popcorn balls also have a yummy touch of peanut butter, you can omit it, or sub with sun butter or almond butter if you have a little one with allergies. If not–live a little–tis the season! 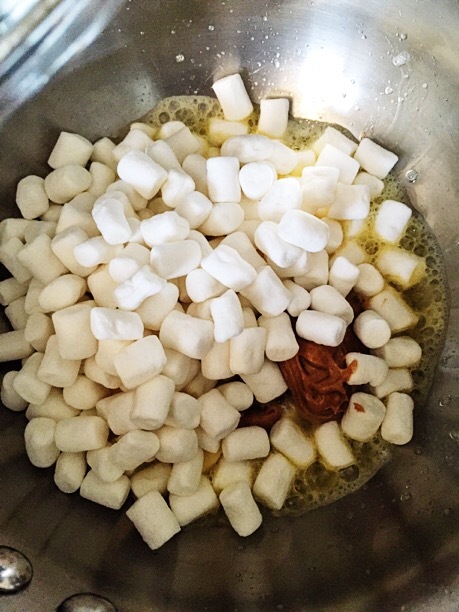 You can make your own marshmallows here’s how, or you can buy a store brand. I got a gluten free version from Whole Foods. 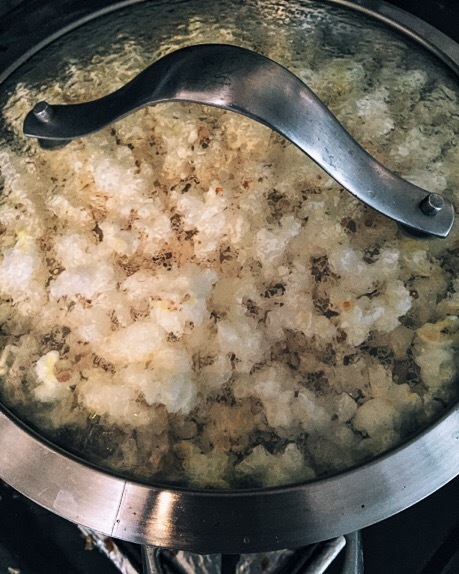 Directions: Pop 1/4 cup of popcorn kernels then set aside in a large bowl. Working quickly pour the marshmallow mixture over the popcorn. 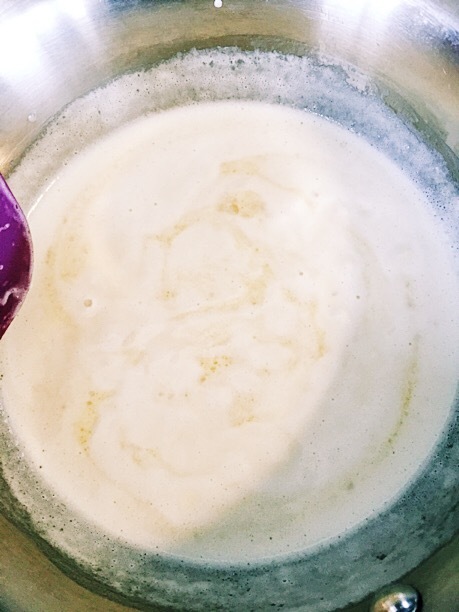 With a spatula work quickly to coat the popcorn in the marshmallow mixture. 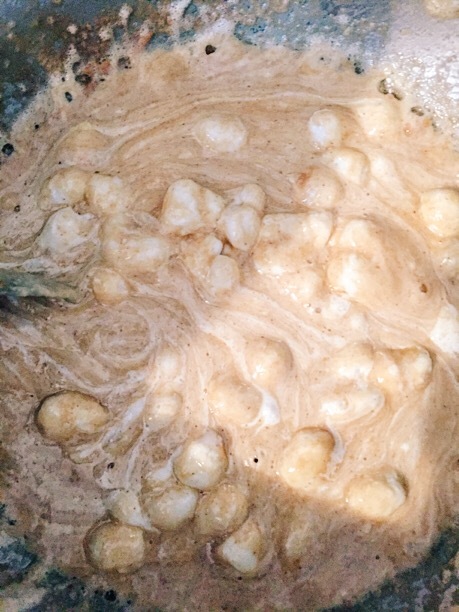 Once all the popcorn has been coated, work quickly to form the popcorn into balls. 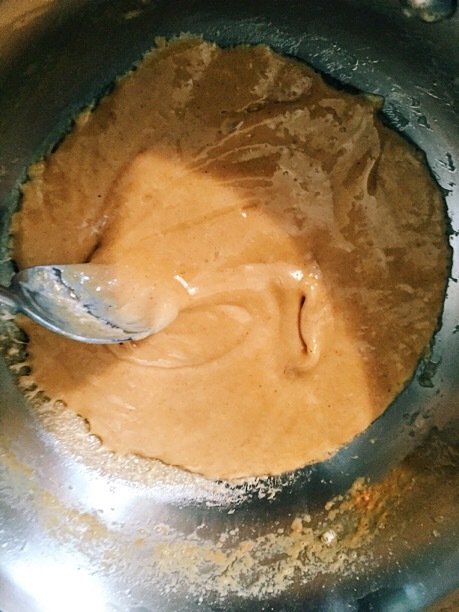 The mixture will still be quite warm so be careful and try not to burn your hands. Once all the balls have been formed serve and enjoy! 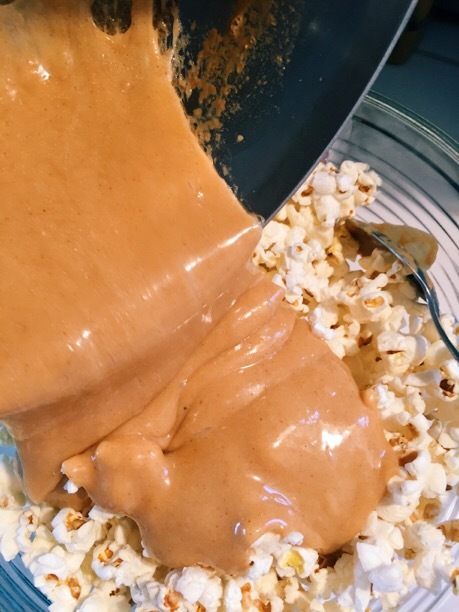 If you like this you’ll probably love my Caramel popcorn with Almonds and coconut recipe, it’s crunchy and oh so delicious! 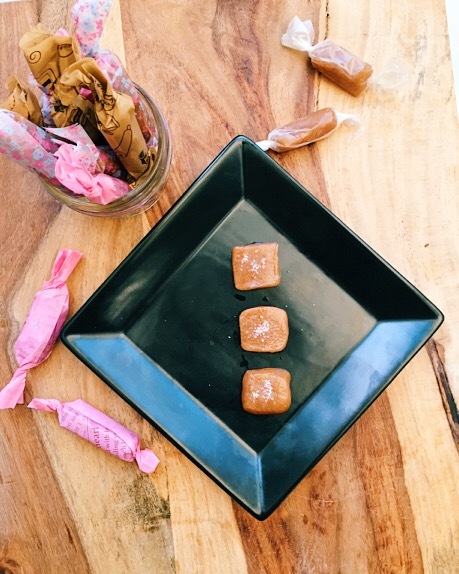 These caramels have been on my ever expanding list of things I’d like to make for a while now. I decided that since Halloween is just within our grasp, why not make these as a special Halloween treat. One of my all time favorite Halloween treats are caramel apples. My mom always bought a package of caramels and on Halloween night we would melt them and make caramel apples. 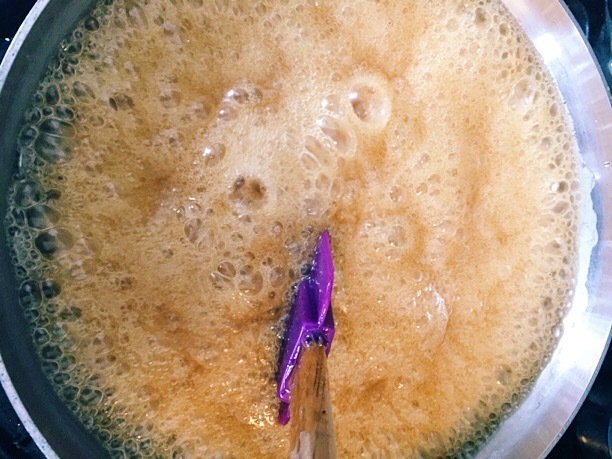 If you have never made caramel before there can be some pitfalls. 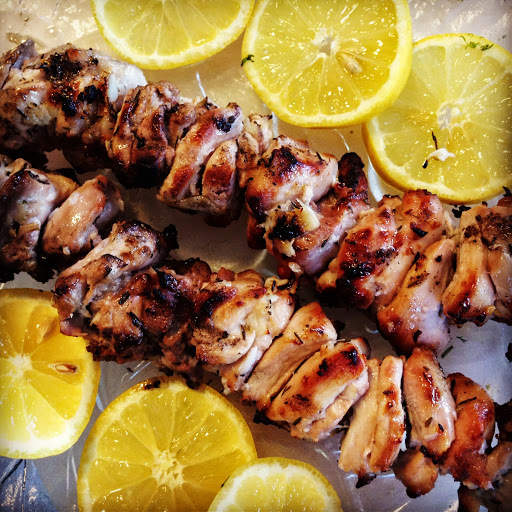 You’ll need a thermometer that can read temps above 250F. 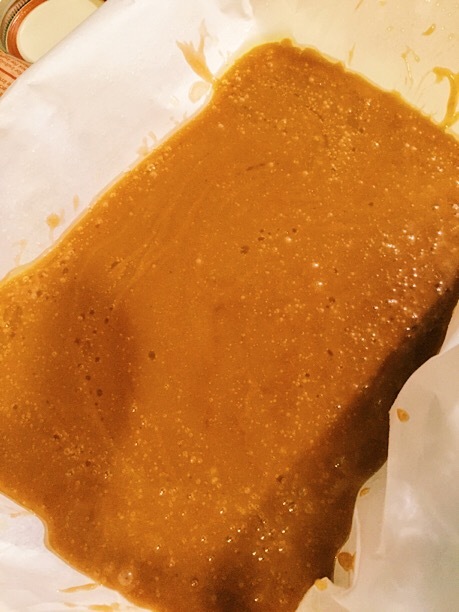 This caramel needs to be heated to 248F. 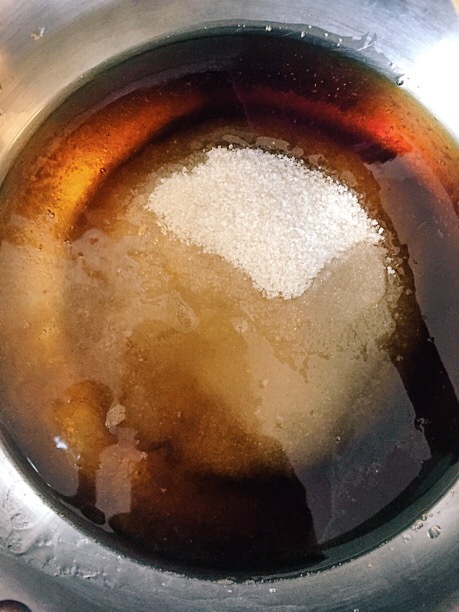 While cooking, it took a considerable amount of time for my caramel to go from 228F to 248F. This happens quite often when making candies of this type. 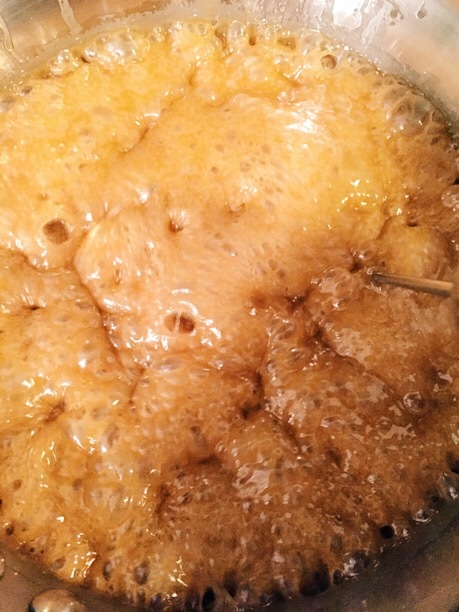 The first time that I made caramel I thought that my thermometer was broken, but it was not. My thermometer just would not go past 230F. 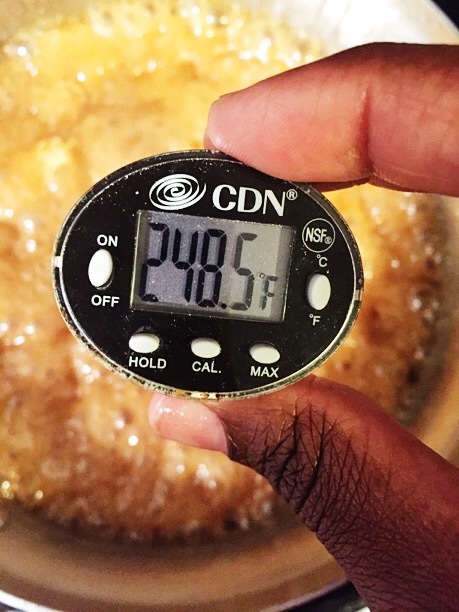 I turned my thermometer off and on, recalibrated it, and yet when I placed it in my caramel it would not budge beyond 230F. My caramel had reached a plateau. 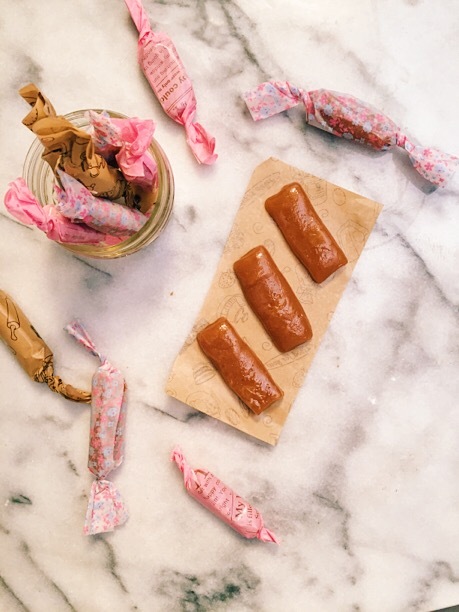 When making candy it takes a considerable amount of energy to burn off enough water to reach a higher temperature. This plateau typically occurs at temps between 230-240F. 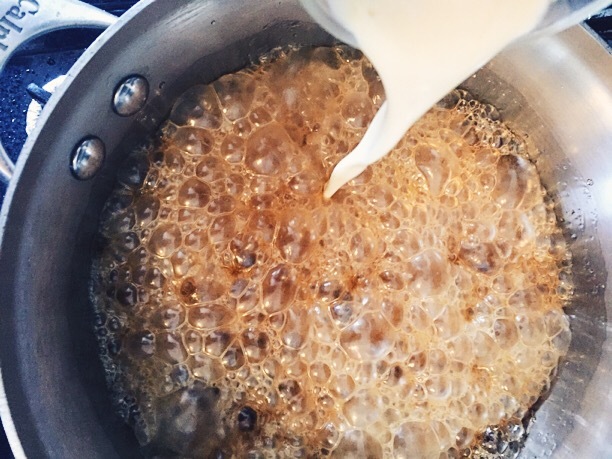 Simply put, do not be surprised or thrown off if you put your thermometer in your caramel and the temperature stalls at 230F and does not rise for 10 minutes. It’s completely normal, and once the water cooks out the temperature will rise. Give it time. 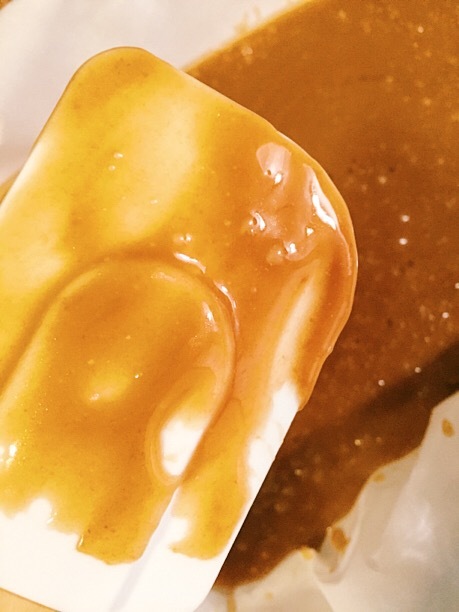 If you don’t the caramel will not set–great if you just want to use this to coat apples, but bad if you want to have them set as a candy. 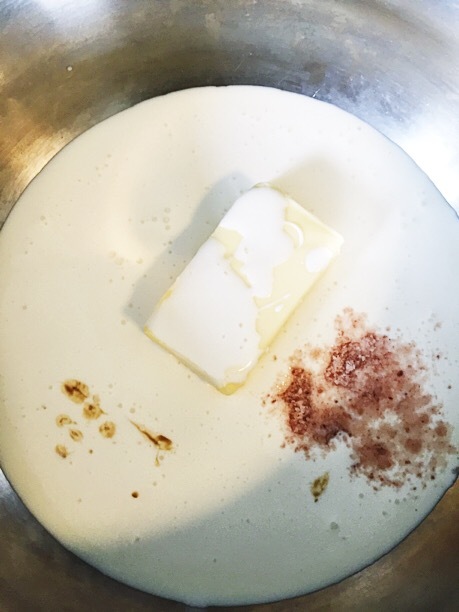 Line a 9 by 11-inch pan with parchment paper spray lightly with oil and set aside. 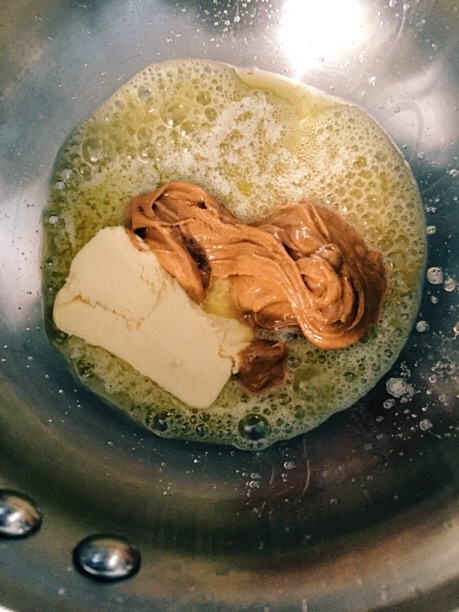 Heat the cream, butter, salt, and maple extract in a sauce pan, once butter melts, remove from heat and set aside. 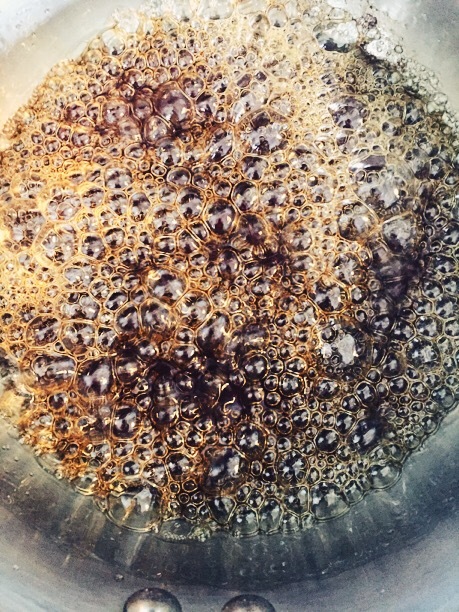 Pour it into the parchment lined pan and let cool for 2 hours. Once cool cut into bite size pieces and enjoy!